We have tried rice dishes from different parts of the world and we had some nice experiences. One thing, however, never fails to amaze us. It is how delicious Somali rice is, considering that it is not a staple food in Somalia. Yes, Somali restaurants serve rice, but for the majority of Somali households in urban areas, pasta is what is consumed on a daily basis. In villages and rural areas across Somalia, the main food is Soor (grits) made of either corn or sorghum. Yet when Somalis invite guests to their home, they serve them rice. Huge platters of rice, flavoured with spices that compliment the natural aroma of the rice. The rice is garnished with Somali Rice Topping (a unique blend of vegetables, raisins and Xawaash). Then on top of that is the crowning glory: chunks of delicious goat meat. Yum! It is a feast for the eyes. Then you dig in, literally. Forget about the spoon and fork. They have yet to invent an implement that is better than a hand, that can rip a piece of meat, cut a slice of banana, and scoop some rice in one fell swoop. Nous avons goûté des plats de riz de différentes parties du monde et toujours avec plaisir. Une chose, cependant nous étonne toujours. C’est que le riz à la Somali est vraiment délicieux, d’autant plus qu’il n’est pas un aliment commun en Somalie. Oui, les restaurants Somalis servent du riz, mais la plupart des foyers Somalis en zones urbaines, ce sont les pâtes qui sont consommées quotidiennement. Dans les villlages et les zones rurales de Somalie, la nourriture principale est Soor (gruau) de maïs ou de sorgho. Pourtant quand les Somalis ont des invités à la maison, ils leurs servent du riz. De grands plats de riz, parfumés aux épices qui se mettent en valeur l’arôme naturel du riz. Le riz est accompagné de Garniture pour riz Somali (un mélange unique de légumes, raisins secs et Xawaash). Et au dessus de tout ça la cerise sur le gâteau: des morceaux de délicieuse viande de chèvre. Yum! C’est un régal pour les yeux. Puis vous attaquez. Pas besoin de cuillère et de fourchette. Il reste encore à inventer un instrument plus efficace qu’une main, qui peut déchirer un morceau de viande, couper une tranche de banane, et ramasser du riz en un seul geste. Prepare the lamb stock. Sauté the onions, garlic, and the spices in the oil. Add the meat and cook for about 2 minutes then add the water. Let it simmer until the stock reduces to about 4.5 cups. Diyaari maraqa hilibka ari. Basasha saliidda ku-dalac, tuunta iyo carcarafta ku-dar. Hilibka ku-rid isku walaaq muddo 2 daqiiqo. Biyaha ku-shub. Kari ilaa maraq oo 4.5 koob ah uu ka-haro. Préparer le bouillon d’agneau. Faire sauter les oignons, l’ail, et les épices dans l’huile. Ajouter la viande et cuire pendant 2 minutes puis ajouter l’eau. Laisser mijoter jusqu’à ce que le bouillon ait réduit à 3 mesures. While the stock is reducing, wash the rice until the water runs clear. Then soak the rice in cold water for half an hour. Maraqa intuu ka-karaayo, bariiska si-fiica u-dhaq. Biyo qaboow la-dhig muddo nusu saac. Pendant que le bouillon réduit, laver le riz jusqu’à ce que l’eau soit claire. Puis tremper le riz dans l’eau froide pendant une demi-heure. Basasha saliidda ku-dalac, tuunta ku-dar, carafta ku-dar. Bariiska oo biyaha aad ka-miirtay ku-dar. Shiil muddo 5 daqiiqo. Maraqa aad miirtay ku-shub. Si-fiican u-walaaq. Dab yar ku-kari muddo nusu saac ama ilaa uu ka-bislaado. Utiliser une grande casserole peu profonde (sauteuse) pour que le riz cuise uniformément. Faire sauter les oignons, l’ail, et les épices dans l’huile et le beurre. Quand les oignons deviennent translucides, ajouter le riz essoré et cuire pendant 5 minutes. Utiliser un tamis pour verser le bouillon chaud sur le mélange de riz. Ajouter la viande. Couvrir la casserole et cuire à feu doux pendant une demi-heure. Ne pas ouvrir le couvercle et laisser sortir la vapeur. This is such a great site and what a wonderful recipe. hambalyo Leila and Abdullahi. Keeping Somali culture alive in spite of political and economic hardships and challenges is a great thing. Thank you Ladan. You are very kind. We are trying to do our little bit and we are enjoying every moment of it. this is the best site thank you so much for sharing wonderful food. Thank you so much for your nice comment. Ramadan Karim. Maashaa Allah!,what an amazing and beneficial website,may almighty Allah reward you for your efforts. I would recommend your page be linked to other popular Somali sites,so that many young Somalis can benefit from it. Awguuriyo!,you made us all proud. Thank you very much Mohamed. As for competing with your wife, we think that the first rounds will definitely go to her. But don’t lose hope… if you take over all the cooking for a few months and let her rest, you’ll probably catch up to her. Cheers! This is my favourite rice dish! Thanks for posting it shall be our dinner tonight God willing. The vegetable seasoning we use is Vegeta Gourmet Seasoning. It is similar to Maggi cubes, but we like Vegeta brand because it is available as a NO MSG seasoning mix. Salaamu aleekum, Walaalkay waan ku salaamay. Salaanta islaanka ayaan kugu salaamay. Bariiska ma haysaa video-kiisa. Ja’askal khayr. Salaanta waan kaa guddoonnay, waana mahadsan tahay! Weli ma-samayn video-ha bariiska. Insha-Allah waan sameyn doonnaa. che buono, con sambusa e muffo…sono il top della cucina somala!!! The vegetable seasoning salt can be replaced with chicken seasoning. We use the potatoes as a garnish for special occasions. Waxaa muuqata biyaha inay ku yar yihiin, biyaha waa inay ka sara maraan bariiska. Digsigana hadduu ku yar yahay wuu kala bislaanaayaa. Bariiska wuxuu ku fiican yahay digsi ballaaran in lagu kariyo. Mahadsanid. Waan ku talajirnaa inaan soo gelino video-ga bariiska, hadduu Eebbe idmo. Mahadsanid. Hello. OMG i cant thank you enough, i made rice for the first time, and i used this recipe of yours, it turn out great. excited about it. cant wait to try more recipe from this site. Thanks Again. We hope you enjoy exploring the website. There are many more recipes to come, God willing. This dish looks so great. I really want see the video. We are planning to make a video for Somali rice, God willing. Thanks. Thank you for you for taking the time to comment. We will post a video for Somali rice, God willing. Adigaa mahadda mudan wlaal. Maqaayad ma-qabno laakiin cunto kariska waan fududeynay si uu qof walba u-karsado cunto fiican. “Cinnamon” waa qorfe. Mahadsanid. Hadduu Eebbe idmo video af-Soomaali ku-qoran ayaan soo gelin doonnaa. Mahadsanid. Mashallah may Allah reward you. Seriously this website is wonderful and you are getting blessing because you teach a person how to cook and they are able to feed their family because of you. again thank you. Thank you very much for your generous comment, and thank you for your confidence in us. And I just want to adds you did such a great job with the website and video, pics, detained instruction. BRAVO! We used riblets (sarar in Somali) to cook the rice. Have the riblets chopped into small pieces. 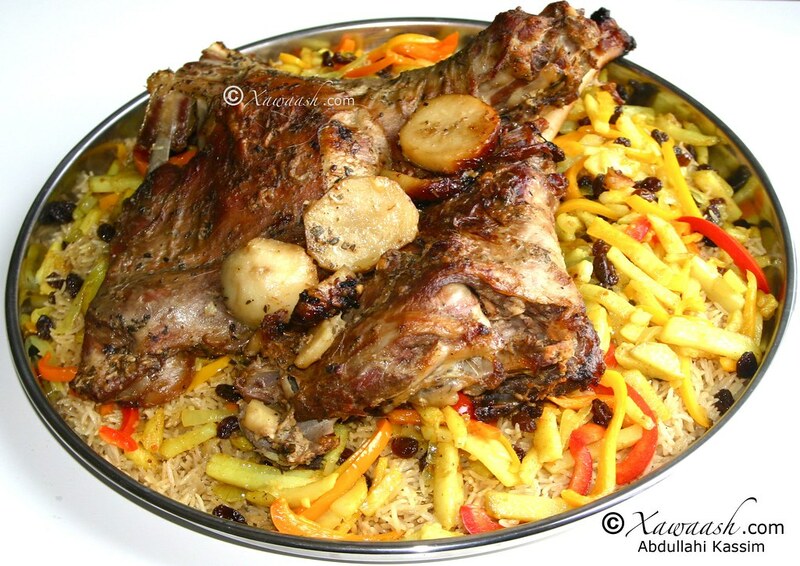 The meat that is shown in the picture, on top of the rice, is roasted lamb or goat cut into large pieces. Here is the link for the roasted goat http://xawaash.com/?p=739. For that recipe you should use fresh goat or lamb. 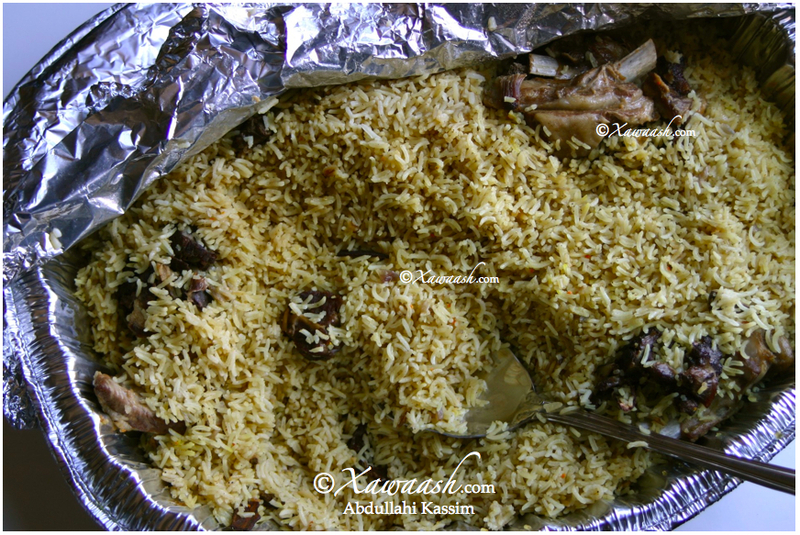 For the potatoes, use the Somali rice topping http://xawaash.com/?p=518. There is a recipe for chilli sauce in the Bajiya post http://xawaash.com/?p=953. God willing, we hope to post recipes (with video) for basbaas (Somali chilli sauce). Thank you. thank you very much. i just love your website. There is no tomato in this recipe. ahh i see thank you!! Your recipes are brilliant, i really cannot wait to try them out ! Allah hafiz!! you are amazing people, Thank you so much, this is absolutely beyond beautiful. May Allah Bless Xawaash.Com Team. I appreciate the great job you’re doing and the time you guys took to make this wonderful website. I’ve found your website from a friend a week ago, I have been great a cooker since, my husband loves my new cooking style lol, and My Mom can’t believe it too, it’s my secret recipe and I am not telling them lol. I truly appericiate it. Thank you. Thank you so much for your lovely words and AMAZING comment. It is great encouragement. We are happy that everyone likes the recipes. Do share those your secret recipes. You are most welcome sister. Thank you for taking the time to comment. i love your recipes they are really nice and well explained we like to thank you for that. God willing, we will make a video for it. Thank you for you comment and for your confidence in our recipes. Thanks to you both for making this brilliant site. Please carry on adding more recipes as well . Thank you very much, Ismail, for the great comment and thank you for your confidence in our recipes. We are very happy that you found the website helpful. I’ve made this a few times and I really like it, Jazakum’Allahu Khairan. 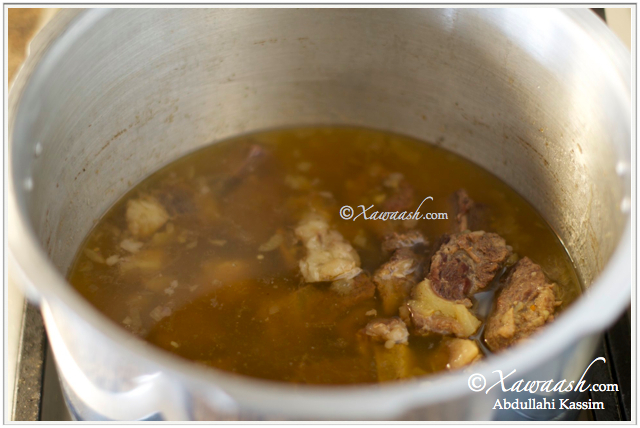 One question walaalayaal: If I don’t have lamb riblets or bones for the stock, can I use a lamb stock cube, or any other alternative and get the same taste? Also, if I can use stock cubes, approximately what quantity? Thank you. I’ve also made your meatballs, somali pilaf, creme caramel, tilapia curry, chicken steak, liver…my favourites are the meatballs; I’ve made them a few times and even made a chicken mince variety. Thank you so much, may Allah reward you. Xawaash is favourited on my tablet! Thank you very much for letting us know. You can use any type of stock you like or 3 cubes of Maggi, Knorr or any type you prefer. 1 Tbsp Vegeta = 2 bouillon cubes. We are happy that you have tried all those recipes. We wish you all the best. Thank you. Xawaash teaam aad iyo aad ayaad u mahadsantihiin, hada aniga ayaa isla yaaba cuntada aan sameeyo waxaan oo xasuustaa BACK HOME Thank you again. Ilaahay ajar ha idinka siiyo howsha aad wadaan. Waan ku faraxnay cunta kariskaada inuu fiicnaaday. Waa ku mahadsan tahay inaad nala socodsiisay. Thank you very much for your nice comment. We wish you all the best. Thank you for the lovely website and it is really useful for learning Somali cooking for the younger generation. However how come there is no video for this recipe? When we started the website we did not make videos for the recipes; later on we added the videos. God willing, when we get time we hope to make videos for those recipes. Thank you very much for your kind words. God bless you. God willing, we will make it. Thank you for your patience. I dont like using royal basmati rice because they are to thin and break so can I use the deer basmati rice cant find the rice you use SELLA basmati rice, Isn’t the Sella basmati parboiled rice same for the deer basmati its parboiled right? You can use any parboiled basmati, but soak it for a longer time. You may also need to adjust the cooking time, depending on how long you have soaked the rice. Thank you. Thank you very much for your comment. God willing, we will add it to the list. Do you mean Khadija Bahluul (MaaKhadija)? okay thanks yes you know her thats my great grandma and her daughter luul thats my grandma luul. We are related. Nice hearing from you. Thank you. Thank you very much for your comment. With the current situation in Somalia, Somalies need every ounce of encouragement. I just discovered your website, and I have the say it is exceptionally amazing. I really like the professionalism and the wonderful recipes you have. Keep up the good work! You make us all proud! I would add my voice to those who have described their love for the bariis recipe and toppings. Whenever you are able to make a video, please post. …I am one happy (and very impressed) fella! can’t wait to try all these amazing recipes. Bother Mukhtar, we are delighted by your comment. It is appreciated. Thank you very much. God willing, we will make a video for the Somali Rice. God bless you and Ramadan Kareem. masha allah waa kufarxay sida aad uu bareysan muslimiinta cunadaan macaan jazakullahi qayran. Ilaahay ha kaa abaal mariyo hadalada wacan. Mahadsanid walaal. MaashaALLAH this is Amazing! I never though that I will see somali website which is such a kinda interesting. brother keep the spirit alive. we really needed this website. and from now on I will be using your recipes. I really loved it and so happy that I found it. RABI hakuu saaidiyo aqoontada iyo xirfadaada xaga cunada somaliyeed. Thank you so much for your kind words. We are happy you like the website. We wish you all the best. Aad iyo aad ayaa ugu mahadsan tahay faallada aadka u fiican aad inoo soo qortay. Waan ku faraxnay inaad ka faa’iidday. Qayr ayaan kuu rajaynaynaa. Maaashaaalllah, you guys are fantastic beyond beneficial. Thank you so much. Keep up the good work. I never thought I could make myself my moms bariis without supervision…thanks to xawaash.com I impressed very hostile guests. ..THE INLAWS!!!! We are very happy the website was so helpful for you, and that you were able to impress your in-laws. Thank you for letting us know. We think you mean this recipe http://xawaash.com/?p=518#sthash.f7X37L7i.dpbs. Please note that this recipe has no video. Give our regards to your mom. Where has this site been my whole life?! Mashallah, you guys have created a masterpiece… It’s so nice and heartwarming to see this site with all my childhood recipes all neatly presented. Often as a young Somali who was born aboard it feels like there is nothing to be proud of our home. This site is a reminder of our rich and proud history, our food is delicious and tells a story about our heritage in itself. I’m really impressed with the enthusiasm and dignity the stories on this site are conveyed. 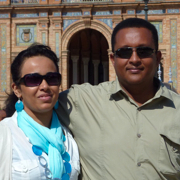 My husband isn’t Somali, and mother lives aboard so this site is really helpful for me to keep my culture and roots alive. Now, I can stop making easy Mexican and Indian meals I can eat the meals my mother cooked for me as a child. And that’s entirely thanks to you both Leila & Abdullahi, aw gyro to you both are an inspiration and a testament to Somali strength and pride. Kept on shining, Amin!! What a wonderful a comment! We don’t know how to thank you for your kind words of praise. It is very gratifying to see how this website has benefited you. Please let us know if there are any foods which you like that we have not posted yet. You are right that for quite some time now positive stories from Somalia are rare. Thank you very, very much. We wish you all the best. I came by this site by pure accident I am a young Somali student at university in London UK and I cannot thank you enough for this site, I am sick and tired of take-aways dry pizzas and quick fixes. So glad you guys took the initiative to create this site thank you once again and God bless you. I absolutely love your videos and website, very helpful and very extensive. I’d like to add however, that rice is a staple food in Somali households! In the countryside it’s even grown there. We don’t make this particular rice dish every day,but we make the rice with tomato or a lighter version of spiced rice two to three times a week unless we’re taking a break and eating muufo, canjeero or sabaayad/kimis with stew instead. Pasta is also commonly cooked in different ways. Soor is also not the only other food eaten in the countryside. Is there any video recipe available of this dish?